The street named Rue Sous le Fort in Old Quebec in Quebec City is adorned with many historic buildings, one being this restaurant/cafe. The reddish brown brick colored building with its colorful signs and beautiful wooden doors open up to the outside seating area. The decor of the tables and chairs are dark blue in color which matches the door and the bordering edge around the windows. This restaurant serves a variety of food with a staff of friendly and qualified people. The outside seating area is a beautiful place to enjoy a meal during the summer. 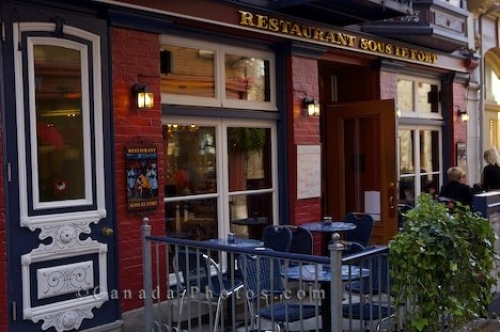 Street Cafe/Restaurant along Rue Sous le Fort, Quartier Petite Champlain in Old Quebec, Quebec City, Quebec, Canada. UNESCO World Heritage Site. Picture of the outside seating at a restaurant along the street in the historic area of Old Quebec, Canada.